I first became acquainted with the Villa Cimbrone in Ravello through the unlikely vehicle of a 1955 Austrian film called Sissi, based on the life of the empress Elisabeth Amalie Eugenie (1837-1898), wife of Franz Joseph I. In the course of the film, she is in seclusion on the beautiful island of Madeira to recover her health. My wife looked at the bucolic scene and said, “That’s in Ravello. Villa Cimbrone.” Indeed the filmmakers had gone on location to this part of Italy for the scene, a villa that is, indeed, fit for a queen. The history of the villa parallels that of Ravello and of the entire Amalfi coast, which is to say that sumptuous villas, including the villa Cimbrone, started cropping up on the coast a thousand years ago. The villa belonged to a noble family called Accongiogioco and then to Fusco, a wealthy and influential family related to the royal Angevin family of Naples. Around the seventeenth century, the history gets shaky, but at some point it became an integral part of a nearby monastery of Santa Chiara. In 1904, Ernest William Beckett, an English gentleman later known as Lord Grimthorpe, fell in love with the villa while on the “Grand Tour” and bought it. He renovated it into what one sees today. 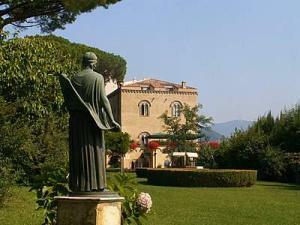 Villa Cimbrone became a luxury hotel hosting some of the juiciest love-affairs and most famous personalities of the 20th century, including E.M. Forster, Virginia Woolf, D.H. Lawrence, the Duke and Duchess of Kent and Winston Churchill. It was the setting for the famous elopement of actress Greta Garbo and conductor Leopold Stokowsky. through this same garden after us in vain. "Until recently it was attributed to D.H. Lawrence, but now we know it is the work of the Persian astronomer and mathematician Omar Khayyam...His writings were appreciated particularly during the 18th century in England." That "original" is the English "translation" by Edward Fitzgerald 1809-83 ("translation" in quotes because it was really a paraphrase and not a translation) of The Rubaiyat of Omar Khayyam, which didn't appear until 1859 and which was totally unknown to English audiences before that. (So much for the 18th century.) What probably happened is that D.H. Lawrence changed the line to suit himself, had it engraved on the tablet and just never told anyone where he got it. I have failed college students for less than that.